(NaturalNews) The vaccine industry is once again pimping the mainstream media to be its marketing mouthpiece for this year's flu "season," with the latest reports claiming that more than half of the country is now seeing a major uptick in flu cases. This year's influenza vaccine admittedly doesn't work against the prevailing virus strain currently in circulation. But the U.S. Centers for Disease Control and Prevention (CDC) is pushing everybody to get one anyway, as is the media. 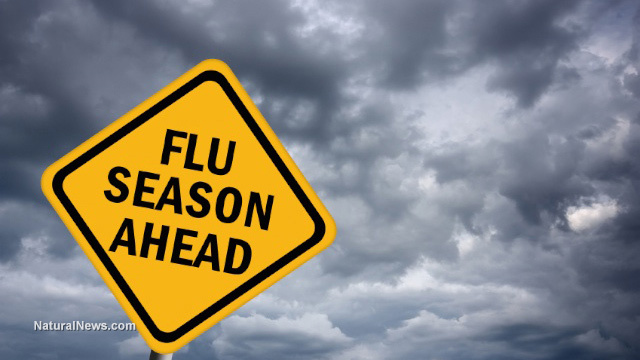 According to CBS News, widespread flu activity is now being reported in 29 states, mostly in the Midwest and South, which is twice the number of states compared to those reported last week. Most of those being hospitalized are very young or very old, with as many as 11 children having died so far this flu season. The obvious agenda, of course, is to scare as many people as possible into getting their flu shots -- if they don't, their holiday plans will be ruined! It's the same tired script we see every year, except this time health authorities openly admit that their precious panacea is a total failure. "We can't tell whether the vaccine won't work against the drifted strains, or will just work less well, but it's something that we're really keeping our eye on," stated Dr. Anne Schuchat, director of the CDC's National Center for Immunization and Respiratory Diseases, to CBS News. "Because the H3N2 is dominating, we probably will see more disease," she added. Despite the fact that Dr. Schuchat blatantly admitted that this year's flu vaccine probably won't work at all for most people, she is still urging the public to get jabbed just for the heck of it. The reason, she says, is that it "might" provide reduced protection as opposed to zero protection, though neither she nor any other CDC scientist can say for sure. "There's a really good chance that people who are vaccinated will have less disease than people who weren't vaccinated this year," she contends. "Might," "probably," and "good chance" are hardly the descriptors one would hope to see from an agency pushing a jab loaded with rat poison, petroleum derivatives and mercury, among other poisons. And yet this is the so-called science backing one of the biggest scams ever perpetrated on the American people -- the flu shot. What's worse is that many of the people who opt for flu shots end up developing flu symptoms as a "side effect," while very few people who skip the shot end up getting sick. This is because the flu shot is highly toxic to the body, provoking an intense immune response that puts incredible strain on a person's health. "The stuff that's circulating out there is different than what they made the vaccine against," added CBS News chief medical correspondent Dr. Jon LaPook. "[A]s of today, it's only about 30 percent well-matched." A normal-matched flu shot, as we reported back in 2011, already only helps about 1.5 out of every 100 people who receive it. If this figure assumes a 100 percent matched flu shot, then that means this year's flu shot is nearly completely ineffective. "The flu vaccine never works for most of us, and this year it's going to be even worse," said holistic family physician Dr. David Brownstein. "They just take their best guess, and they're often wrong. But right or wrong, there's never any real difference in the numbers of cases of flu whether the vaccine is a good match or not."